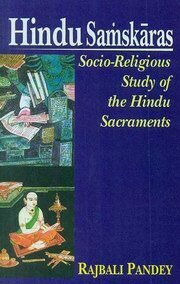 The Hindu Samskaras give expression to aspirations and ideals of the Hindus. They aim at securing the welfare of the performer and developing his personality. They go back to a hoary antiquity. The Vedas, the Brahmanas, the Grhyasutras, the Dharmasutras, the Smrtis and other treatises describe the rites, ceremonies and customs here and there but they do not present them in their historical evolution. The present work is a systematic study of all the Samskaras enjoined to be performed at the various epochs in the life of an individual from conception to crematorium. The author has cited parallels in other religions to show that they are universal and have a recognised place in ancient cultures and are still represented within the limits of modern religion. He has also shown that the sacramental beliefs and practices, far from being an irrational priestcraft, are consistent and logical and have practical utility and intention. This work discusses the source, meaning, number, purpose and the constituents of Samskaras grouped under five heads: prenatal, natal, educational, nuptial and funeral. Besides being a landmark in Hindu culture, it presents patterns of life based on high ethical, spiritual and humanistic values.